As experts in light truck repair and maintenance, the pros at Green Tree Auto Care have the knowledge and skill to keep your vehicle in the best condition possible. They don’t just repair vehicles and move on to the next one – Green Tree is constantly staying on top of new technology that assists with maintenance, repair, and customer service. With today’s automobiles, electronic and digital diagnosis is paramount and gives accurate and quick information about a vehicles current performance and what needs to be improved. With the bulk of their work focused on light trucks, including SUVs and vans, they have a lot of experience when it comes to the different problems that may arise in specific makes and models of vehicles. He says certain vehicles tend to require repairs dealing with one particular component that may be the result of a factory or manufacturing process, and he and his crew are familiar with these patterns. As a result they know what needs to be done and can avoid replacing unnecessary parts. The shop also has the expertise to work on diesel engines, a popular choice for truck enthusiasts. The shop itself is clean and bright and boasts the latest in automotive repair technology including a brand new hi-tech alignment machine that is faster, easier to use, and provides more information than old-style machines. As anyone who drives a truck knows, truck enthusiasts usually don’t just buy a truck and drive away. They like to attach accessories to personalize it. Green Tree Auto has a full line-up of truck accessories from aesthetic applications to performance-enhancing items and lift kits. They have a showroom with available products but also can order in just about anything else you need to make your truck look or perform better. Tires are a priority for many truck owners and with the winter hopefully over the switch to summer rubber is under way. Green Tree offers a full line-up of tires and with just about every manufacturer currently offering rebates it’s a good time to see what’s available and get your vehicle ready for warm weather cruising. The shop is also plugged into computer software and Iphone apps that allow electronic maintenance reports for drivers and even allow you to request a maintenance appointment on-line. 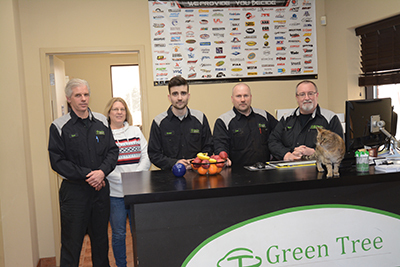 Green Tree Auto Centre has been serving Orangeville since 2008. They are currently in their fifth year at their Riddell Road location.